MBS162842 is a ready-to-use microwell, strip plate ELISA (enzyme-linked immunosorbent assay) Kit for analyzing the presence of the Bone Morphogenetic Protein 1 (BMP1) ELISA Kit target analytes in biological samples. The concentration gradients of the kit standards or positive controls render a theoretical kit detection range in biological research samples containing BMP1. The ELISA analytical biochemical technique of the MBS162842 kit is based on BMP1 antibody-BMP1 antigen interactions (immunosorbency) and an HRP colorimetric detection system to detect BMP1 antigen targets in samples. The ELISA Kit is designed to detect native, not recombinant, BMP1. Appropriate sample types may include undiluted body fluids and/or tissue homogenates, secretions. Quality control assays assessing reproducibility identified the intra-assay CV (%) and inter-assay CV(%). Intended Uses: This sandwich kit is for the accurate quantitative detection of Mouse Bone Morphogenetic Protein 1 (also known as BMP1) in serum, plasma, cell culture supernates, cell lysates, tissue homogenates. Principles of the Assay: This kit is an Enzyme-Linked Immunosorbent Assay (ELISA). The plate has been pre-coated with Mouse BMP1 antibody. BMP1 present in the sample is added and binds to antibodies coated on the wells. And then biotinylated Mouse BMP1 Antibody is added and binds to BMP1 in the sample. Then Streptavidin-HRP is added and binds to the Biotinylated BMP1 antibody. After incubation unbound Streptavidin-HRP is washed away during a washing step. Substrate solution is then added and color develops in proportion to the amount of Mouse BMP1. 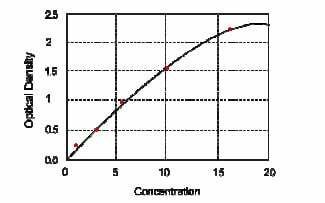 The reaction is terminated by addition of acidic stop solution and absorbance is measured at 450 nm. Cleaves the C-terminal propeptides of procollagen I, II and III. Induces cartilage and bone formation. May participate in dorsoventral patterning during early development by cleaving chordin (CHRD). Responsible for the proteolytic activation of lysyl oxidase LOX. 1. Mechanical stress affects the osteogenic differentiation of human ligamentum flavum cells via the BMP-Smad1 signaling pathway.